Helene Bertha Amalie "Leni" Riefenstahl (German: [ˈʁiːfənʃtaːl]; 22 August 1902 – 8 September 2003) was a German film director, producer, screenwriter, editor, photographer, actress, dancer, and ostensible propagandist for the Nazis. 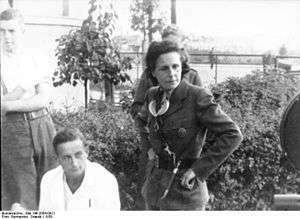 Born in 1902 into a Lutheran Protestant family, Leni Riefenstahl grew up in Germany with her brother Heinz (1905–1944), who was killed on the Eastern Front in World War II. A talented swimmer and artist, she also became interested in dancing during her childhood, taking dancing lessons and performing across Europe. After seeing a promotional poster for the 1924 film Der Berg des Schicksals ("The Mountain of Destiny"), Riefenstahl was inspired to move into acting. Between 1925 and 1929, she starred in five successful motion pictures. In 1932, Riefenstahl decided to try directing with her own film called Das Blaue Licht ("The Blue Light"). In the 1930s, she directed Triumph des Willens ("Triumph of the Will") and Olympia, resulting in worldwide attention and acclaim. Both movies are widely considered two of the most effective, and technically innovative, propaganda films ever made. Her involvement in Triumph des Willens, however, significantly damaged her career and reputation after the war. The exact nature of her relationship with Nazi Party leader Adolf Hitler remains a matter of debate, although a friendship is claimed to have existed. After the war, Riefenstahl was arrested, but classified as being a "fellow traveler" or "Nazi Sympathiser" only and was not associated with war crimes. Throughout her life, she denied having known about the Holocaust, and won nearly 50 libel cases. Besides directing, Riefenstahl released an autobiography and wrote several books on the Nuba people. 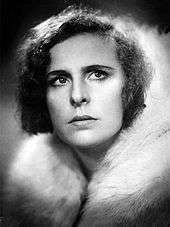 Helene Bertha Amalie Riefenstahl was born in Germany on 22 August 1902. Her father, Alfred Theodor Paul Riefenstahl, owned a successful heating and ventilation company and wanted his daughter to follow him into the business world. Since Riefenstahl was the only child for several years, Alfred wanted her to carry on the family name and secure the family fortune. However, her mother, Bertha Ida (Scherlach), who had been a part-time seamstress before her marriage, had faith in Riefenstahl and believed that her daughter's future was in show business. Riefenstahl had a younger brother, Heinz, who was killed at the age of 39 on the Eastern Front in Nazi Germany's war against the Soviet Union. On one of her adventures, Riefenstahl met Luis Trenker, who was an actor from Der Berg des Schicksals. At a meeting arranged by her friend Gunther Rahn, she met Arnold Fanck, the director of Der Berg des Schicksals and a pioneer of the mountain film genre. Fanck was working on a film in Berlin. After Riefenstahl told him how much she admired his work, she also convinced him of her acting skill. She persuaded him to feature her in one of his movies. Riefenstahl later received a package from Fanck containing the script of the 1926 film Der Heilige Berg ("The Holy Mountain"). She made a series of films for Fanck, where she learned from him acting and film editing techniques. One of Fanck's films that brought Riefenstahl into the limelight was Die Weisse Hölle vom Piz Palü ("The White Hell of Piz Palü") of 1929, co-directed by G. W. Pabst. Her fame spread to countries outside Germany. In 1933, Riefenstahl appeared in the U.S.-German co-productions of the Arnold Fanck-directed, German-language SOS Eisberg and the Tay Garnett-directed, English-language SOS Iceberg. The movies were filmed simultaneously in English and German and produced and distributed by Universal Studios. Her role as an actress in SOS Iceberg was her only English language role in film. After meeting Hitler, Riefenstahl was offered the opportunity to direct Der Sieg des Glaubens ("The Victory of Faith"), an hour-long propaganda film about the fifth Nuremberg Rally in 1933. Riefenstahl agreed to direct the movie. She and Hitler got on well, forming a friendly relationship. The propaganda film was funded entirely by the NSDAP. Impressed with Riefenstahl's work, Hitler asked her to film Triumph des Willens ("Triumph of the Will"), a new propaganda film about the 1934 party rally in Nuremberg. More than one million Germans participated in the rally. Initially, according to Riefenstahl, she resisted and did not want to create further Nazi Party films, instead wanting to direct a feature film based on Hitler's favourite opera, Eugen d'Albert's Tiefland ("Lowlands"). Riefenstahl received private funding for the production of Tiefland, but the filming in Spain was derailed and the project was cancelled. Hitler was able to convince her to film Triumph des Willens on the condition that she would not be required to make further films for the party, according to Riefenstahl. The motion picture was generally recognized as an epic, innovative work of propaganda filmmaking. The film took Riefenstahl's career to a new level and gave her further international recognition. Hitler invited Riefenstahl to film the 1936 Summer Olympics scheduled to be held in Berlin, a film which Riefenstahl claimed had been commissioned by the International Olympic Committee. She visited Greece to take footage of the route of the inaugural torch relay and the games' original site at Olympia, where she was aided by Greek photographer Nelly's. This material became Olympia, a hugely successful film which has since been widely noted for its technical and aesthetic achievements. She was one of the first filmmakers to use tracking shots in a documentary, placing a camera on rails to follow the athletes' movement. The film is also noted for its slow motion shots. Riefenstahl played with the idea of slow motion, underwater diving shots, extremely high and low shooting angles, panoramic aerial shots, and tracking system shots for allowing fast action. Many of these shots were relatively unheard of at the time, but Leni’s use caused many of them to become, and is the reason why they are still used to this day. Riefenstahl's work on Olympia has been cited as a major influence in modern sports photography. Riefenstahl filmed competitors of all races, including African-American Jesse Owens in what later became famous footage. 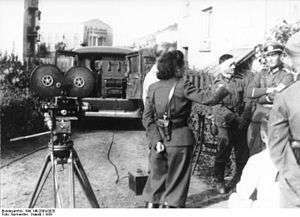 When Germany invaded Poland on 1 September 1939, Riefenstahl was photographed in Poland wearing a military uniform and a pistol on her belt in the company of German soldiers; she had gone to Poland as a war correspondent. On 12 September, she was in the town of Końskie when 30 civilians were executed in retaliation for an alleged attack on German soldiers. According to her memoir, Riefenstahl tried to intervene but a furious German soldier held her at gunpoint and threatened to shoot her on the spot. She claimed she did not realize the victims were Jews. Closeup photographs of a distraught Riefenstahl survive from that day. Nevertheless, by 5 October 1939, Riefenstahl was back in occupied Poland filming Hitler's victory parade in Warsaw. Afterwards, she left Poland and chose not to make any more Nazi-related movies. Most of Riefenstahl's unfinished projects were lost towards the end of the war. The French government confiscated all of her editing equipment, along with the production reels of Tiefland. After years of legal wrangling, these were returned to her, but the French government had reportedly damaged some of the film stock whilst trying to develop and edit it, with a few key scenes being missing (although Riefenstahl was surprised to find the original negatives for Olympia in the same shipment). She edited and dubbed the remaining material and Tiefland premiered on 11 February 1954 in Stuttgart. However, it was denied entry into the Cannes Film Festival. Although Riefenstahl lived for almost another half century, Tiefland was her last feature film. In 1954, Jean Cocteau, who greatly admired the film, insisted on Tiefland being shown at the Cannes Film Festival, which he was running that year. In 1960, Riefenstahl attempted to prevent filmmaker Erwin Leiser from juxtaposing scenes from Triumph des Willens with footage from concentration camps in his film Mein Kampf. Riefenstahl had high hopes for a collaboration with Cocteau called Friedrich und Voltaire ("Friedrich and Voltaire"), wherein Cocteau was to play two roles. They thought the film might symbolize the love-hate relationship between Germany and France. Cocteau's illness and 1963 death put an end to the project. A musical remake of Das Blaue Licht ("The Blue Light") with L. Ron Hubbard, a science fiction writer and founder of Scientology, also fell apart. Riefenstahl claimed she was fascinated by the Nazis, but also politically naive, remaining ignorant about war crimes. Throughout 1945 to 1948, she was held by various Allied-controlled prison camps across Germany. She was also under house arrest for a period of time. Despite being tried four times by postwar authorities, Riefenstahl was never convicted in any denazification trial. She was found to be a fellow traveler only who merely sympathized with the Nazis. 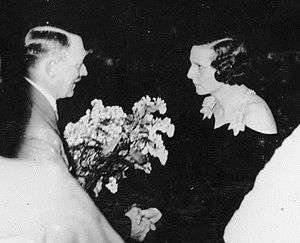 Riefenstahl said that her biggest regret in life was meeting Hitler, declaring, "It was the biggest catastrophe of my life. Until the day I die people will keep saying, 'Leni is a Nazi', and I'll keep saying, 'But what did she do?'" Even though she went on to win up to 50 libel cases, details about her relation to National Socialism generally remain unclear. Riefenstahl's books with photographs of the Nuba tribes were published in 1974 and republished in 1976 as Die Nuba (translated as "The Last of the Nuba") and Die Nuba von Kau ("The Nuba People of Kau"). While heralded by many as outstanding colour photographs, they were harshly criticized by Susan Sontag, who claimed in a review that they were further evidence of Riefenstahl's "fascist aesthetics". The Art Director's Club of Germany awarded Riefenstahl a gold medal for the best photographic achievement of 1975. She also sold some of the pictures to German magazines. She photographed the 1972 Olympic Games in Munich, and rock star Mick Jagger along with his wife Bianca for The Sunday Times. Years later, Riefenstahl photographed Las Vegas entertainers Siegfried & Roy. She was guest of honour at the 1976 Olympic Games in Montreal, Canada. In 1978, Riefenstahl published a book of her sub-aquatic photographs called Korallengärten ("Coral Gardens"), followed by the 1990 book Wunder unter Wasser ("Wonder under Water"). In her 90s, Riefenstahl was still photographing marine life and gained the distinction of being one of the world's oldest scuba divers. On 22 August 2002, her 100th birthday, she released the film Impressionen unter Wasser ("Underwater Impressions"), an idealized documentary of life in the oceans and her first film in over 25 years. Riefenstahl was a member of Greenpeace for eight years. Riefenstahl survived a helicopter crash in Sudan in 2000 while trying to learn the fates of her Nuba friends during the Second Sudanese Civil War and was airlifted to a Munich hospital. Riefenstahl celebrated her 101st birthday on 22 August 2003 at a hotel in Feldafing, on Lake Starnberg, Bavaria, near her home. However, the day after her birthday celebration, she became ill. In 1993, Riefenstahl was the subject of the award-winning German documentary film The Wonderful, Horrible Life of Leni Riefenstahl, directed by Ray Müller. Riefenstahl appeared in the film and answered several questions and detailed the production of her films. The biofilm was nominated for seven Emmy Awards, winning in one category. 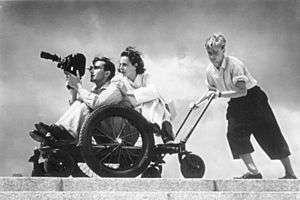 Riefenstahl, who for some time had been working on her memoirs, decided to cooperate this documentary to tell her life story about the struggles she had gone through in her personal life, her film-making career and what people thought of her. She was also the subject of Müller's 2000 documentary film Leni Riefenstahl: Her Dream of Africa, about her return to Sudan to visit the Nuba people. In April 2007, The Guardian reported that British screenwriter Rupert Walters was writing a movie based on Riefenstahl's life which would star actress Jodie Foster. 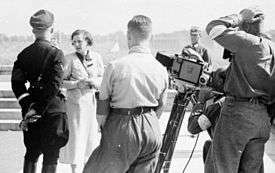 The project did not receive Riefenstahl's approval prior to her death, as Riefenstahl asked for a veto on any scenes to which she did not agree. Riefenstahl also wanted Sharon Stone to play her rather than Foster, which ultimately resulted in the cancellation of the project. In 2011, director Steven Soderbergh revealed that he had also been working on a biopic of Riefenstahl for about six months. He eventually abandoned the project over concerns of its commercial prospects and instead pursued the pandemic thriller Contagion. Riefenstahl was portrayed by Zdena Studenková in Leni, a 2014 Slovak drama play about her fictional participation in the The Tonight Show Starring Johnny Carson. In Czech version of the play she was portrayed by Vilma Cibulková. Riefenstahl was portrayed by Dutch actress Carice van Houten in Race, a sports drama film directed by Stephen Hopkins about Jesse Owens. It was released in North America on February 19, 2016. To make her sympathetic portrayal acceptable for an American audience, the film dramatizes her quarrels with Goebbels over her direction of the film, Olympia, especially about filming the African American star who is proving to be a politically embarrassing refutation of Nazi Germany's claims of Aryan athletic supremacy. Riefenstahl, Leni (1973). Die Nuba [The Last of the Nuba]. ISBN 0-312-13642-0. Riefenstahl, Leni (1976). Die Nuba von Kau [The Nuba People of Kau]. ISBN 0-312-16963-9. Riefenstahl, Leni (1978). Korallengärten [Coral Gardens]. ISBN 0-06-013591-3. Riefenstahl, Leni (1982). Mein Afrika [Vanishing Africa]. ISBN 0-517-54914-X. Riefenstahl, Leni (1987). Leni Riefenstahl's Memoiren [Leni Riefenstahl's Memoir]. ISBN 3-8228-0834-2. Riefenstahl, Leni (1990). Wunder unter Wasser [Wonder under Water]. ISBN 3-7766-1651-2. Riefenstahl, Leni (1995). Leni Riefenstahl: a memoir. New York: Picador USA. ISBN 9780312119263.
Review: hooks, bell (1997). "Review: the feminazi mystique". Transition. Indiana University Press on behalf of the Hutchins Center for African and African American Research at Harvard University via JSTOR. 73: 156–162. doi:10.2307/2935451. JSTOR 2935451. Riefenstahl, Leni (2002). Africa. ISBN 3-8228-1616-7. Riefenstahl, Leni (2002). Riefenstahl Olympia. ISBN 3-8228-1945-X. 1 2 3 4 5 6 7 8 9 10 11 12 13 14 15 16 17 18 19 20 21 22 23 24 25 26 27 28 29 30 University of Washington 2008. ↑ Rother 2003, p. 112. 1 2 Salkeld 2011, p. 2. 1 2 3 4 Falcon 2003. 1 2 Infield 1976, pp. 14–16. 1 2 3 4 5 6 7 8 9 10 11 Langford 2012, p. 20. ↑ Langford 2012, p. 77. 1 2 3 4 5 6 7 8 9 James 2007. 1 2 3 Hinton 2000, p. 19. ↑ Salkeld 2001, pp. 14–16. 1 2 3 4 5 Downing 2012, p. 23. 1 2 3 Hinton 2000, p. 20. ↑ The History Place 2001. 1 2 Hinton 2000, pp. 21–22. ↑ Hinton 2000, p. 21. 1 2 Rother 2003, p. 238. ↑ Aitken 2013, p. 760. 1 2 3 4 Tomlinson 2012, pp. 74–76. 1 2 3 Andrew 1999, pp. 183–184. ↑ "Leni Riefenstahl". Jewish Virtual Library. Jewish Virtual Libraray. ↑ Edmondson 2007, p. 72. ↑ F-R Publishing Corporation 2007. 1 2 3 4 5 Graham 1993. ↑ Bernstein 2013, p. 111. 1 2 3 4 5 6 7 Harris 2007. 1 2 3 4 5 6 Moore 2003. 1 2 3 4 5 Kenrick 2006, p. 197. 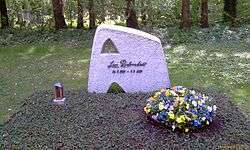 ↑ "Helene Bertha Amalie "Leni" Riefenstahl (August 22 1902 – September 8 2003)"
↑ Trimborn 2008, pp. 206–208. ↑ Heck-Rabi 1984, p. 126. 1 2 3 Hinton 2000, p. 135. ↑ Hinton 2000, p. 136. 1 2 3 Rhiel, O'Sickey & Pages 2008, p. 244. ↑ Salkeld 2011, p. 253. ↑ Salkeld 2011, p. Chapter 17, page 1-3. 1 2 3 4 5 6 7 The Scotsman 2012. 1 2 3 Corliss 2002. ↑ "Salem Senior Loughry Could Be World's Oldest Female Scuba Diver"
1 2 BBC News 2001. ↑ "Leni Riefenstahl (Helene Riefenstahl)"
↑ Rhiel, O'Sickey & Pages 2008, p. 245. ↑ World Press Review 2014. 1 2 3 Gale 2007, p. 3276. ↑ Slovenské Národné Divadlo 2014. ↑ "Weeds Episode Scripts N/A - It's Time (Part 1)"
Buruma, Ian (14 June 2007). "Fascinating Narcissim". The New York Review of Books. Retrieved 7 June 2015. Corliss, Richard (22 August 2002). "That Old Feeling: Leni's Triumph". Time Magazine. Retrieved 7 June 2015. "Fascinating Fascism". The New York Review of Books. 6 February 1976. Retrieved 2 June 2015. 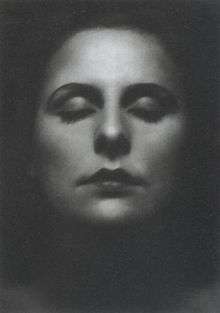 "Riefenstahl, Bertha Hélène Amalie "Leni"". Find a Grave. Retrieved 7 June 2015.